Noel is out to prove to the five teams that passed on him that his best days aren't over. FOR 72 HOURS in mid-February, as everyone else watched (and rewatched) Nerlens Noel rupture an anterior cruciate ligament on national television, the mother of the top prospect in college basketball knew nothing of the harm that had befallen her baby boy. On Feb. 12 -- the very same day Kentucky would play that fateful game in Gainesville, Fla. -- Dorcina Noel had arrived in the Haitian coastal city of Gonaïves, where her 81-year-old mother had just suffered a stroke. Lost in the chaos of one medical emergency, Dorcina never saw her son's left knee buckle after the 6'10" center swatted away a Florida layup. She never saw him writhe on his back, screaming. She never saw five teammates carry the 215-pound freshman toward the locker room. And she never got a call from Nerlens, who had already phoned Jim, his oldest brother, with a single, insistent request. "I knew what she was going through, and I didn't want to stress her out even more," Nerlens says now. The family-wide embargo held for three days. Then, on the night of Feb. 15, the four Noel siblings -- fearing the ubiquity of the highlights, even overseas -- caved at last. All Dorcina had been told was that Kentucky had lost to Florida. But when she called and Jim told her about Nerlens' "knee problem," the recently retired nurse commandeered a laptop from one of her nephews in Gonaïves. "I said, 'Let me check on the Internet,'" Dorcina says. "And when I saw Nerlens on the floor, screaming?" She cried so loudly her relatives assumed her ailing mother had just passed away. "My mom couldn't talk," Dorcina recalls, "but she was looking at me, and she started crying too." WHEN NOEL AWOKE in Lexington, Ky., the morning after his injury, his leg in ice and a future in doubt, the first thing he did was Google. "I started looking up everything that had to do with an ACL. I had no idea: what it looks like, what it does, where it is, how long it takes to rehab." He'd heard of other athletes tearing ACLs -- had seen South Carolina tailback Marcus Lattimore obliterate his right knee last autumn -- but clarity came only with the next day's MRI results. And in his dormitory bed, Noel cried for two solid minutes as the notion of six months of recovery, minimum, sunk in. In high school, he'd famously swatted 22 shots in one game, sparking the obligatory comparisons to Bill Russell. At Kentucky, he'd loomed as a threat to break Anthony Davis' NCAA freshman record of 186 blocks in a season, collecting 106 in just 24 games. NBA scouts had widely projected him to go No. 1 overall for more than a year. But suddenly, literally overnight, Noel had become a mystery -- even to himself. To Dorcina, though? He only gushed confidence. "I told her, very simply, that the problem was not that serious, that everything will be good, that I'll be back playing soon," he says. It was enough to persuade her not to fly home that instant, but the work required to make good on his predictions had scarcely begun. Not that serious? Fans could trace entire genealogies of big men undone by orthopedic complications. Everything will be good? At the draft combine in Chicago, Noel showed up weighing 206 pounds -- no drafted center in the past decade had been lighter. I'll be back playing soon? Tell that to the Bulls, for whom star Derrick Rose, more than a year after ACL reconstruction, remains a highly compensated Godot. IT'S A SWELTERING May afternoon, a few weeks before Noel would stun prognosticators by sliding to the sixth pick in the NBA draft, and Dorcina is visiting her son at his pre-furnished two-bedroom condo in Birmingham, Ala. In March, following surgery by James Andrews in Pensacola, Fla., Noel had moved here, on Andrews' advice, to rehab at Champion Sports Medicine. The spindly Everett, Mass., native had never set foot in Birmingham or met his physical therapist, Kevin Wilk, in person before. He knew that plenty of high-profile athletes rehabbed at CSM; Rose spent a week there last year. What he did not know was that Rose had suffered an injury that was far more alarming. 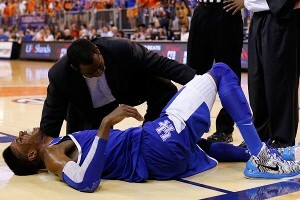 Noel, unlike Rose, didn't suffer a twisting collapse of his knee or sprout a significant bone bruise. "On a scale of 1 to 10, Nerlens is probably a 4," says Wilk, describing the slightly less than average severity of Noel's original injury. "He's so young, and his joint surfaces," which can impact pain and swelling and hamper recovery, "are pristine." The physical therapist pauses. "But the real issue is, Are you as good as you were pre-injury? That's what everybody freaks out about." A snapshot of Noel's recovery, to which he devotes about 40 hours a week. So it was that back in Birmingham on March 16, the two had agreed on a rigorous itinerary. Each weekday, starting at 9 a.m., they would perform some seven hours of rehab, spread out over two shifts; every weekend, half as much. First, they'd focus on reducing swelling, straightening the knee and forestalling blood clots. Then they'd work on regaining muscle control while restoring lost mass. Finally, they'd reinforce the thighs, hips and core, in hopes of preventing a future tear. It would all occur in a huge carpeted room ringed by the framed jerseys of ex-patients but populated by everyday Joes -- pubescent baseball players, past-their-prime weekend warriors. And now, over one two-day period in late May, that gallery watches as Noel completes a series of about 20 exercises, ranging from lateral slides (with trainer Luke Miller pulling Noel's body in the opposite direction with an elastic cord) to lat pull-downs to hamstring curls to single-leg bridges with manual resistance (one leg extended with the hips off the ground) to light jogging on an antigravity treadmill. "You're starting to get some veins in those arms, bud," the center's director of athletic performance, Luke Wakefield, tells him after one grueling encounter with kettlebells. "They weren't there last time." Yet as punishing as virtually every upper-body exercise seems -- one expletive-peppered workout with ropes recalled Hugh Jackman in the opening scene of Les Miserables -- Noel plods ahead. Amid the slog, his source of stamina and motivation does not waver: He recalls how Dorcina worked two shifts of her own, at three different nursing homes, from 6 a.m. to 2 p.m., then 2:30 to 11 p.m. How she carried, cleaned and fed patients, driving among the Boston suburbs of Brighton and Stoneham and Brookline in those 30 spare minutes. How weekends meant double-overtime. How Wednesday was her lone day off. How Dorcina showered at work and kept uniforms in the car. It's an argument on behalf of genetics that Wilk's primary concern for Noel is not pushing him but holding back. 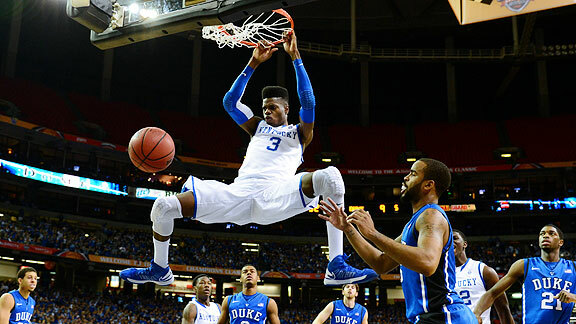 "Nerlens thinks he can do everything, so we preach to him all the time: no twisting, no pivoting, no jumping," says Wilk, who estimates that his patient is two to three weeks ahead of schedule. "He's been chomping at the bit, driving me nuts." IT'S DINNERTIME NOW, and back inside Noel's apartment, the aroma of home cooking wafts through the living room. But when you're trying to gain up to 5 pounds a month, the skillet can take a man only so far. To build muscle mass, Wilk has Noel downing two to three shakes of whey protein and milk per day. Ideally, the young big man would outeat his metabolism by guzzling chicken, fish, fruits and vegetables on top of that. Were he in the NBA, with signing bonus in hand, a personal chef could see to it. Instead, he's caught in the limbo between college cocoon and a pro contract. So for now, Dorcina's array of Haitian-style chicken, rice, eggplant/carrot/spinach/shrimp stew and macaroni and cheese with Spam will suffice. Mound upon mound of it spills over into containers bound for the fridge, a Tupperware party on steroids. Grabbing two plates and a Gatorade, Noel reclines in a wooden chair in front of the TV, which alternates between NBA 2K13 (he typically plays as the Thunder) and FIFA 13 (today he's Spain) on Xbox. And as Dorcina watches from the dining table, half eating and half supervising her son and his two college-age friends from Lexington who've been crashing for a few days, it's impossible to ignore just how young Nerlens actually is. Press him on when he can take the court as a pro -- a question he's been asked hundreds of times now, by reporters and GMs alike -- and he drones boilerplate about "being careful with this process" and "coming back when I feel comfortable, if not better than before." But hand him a controller and challenge him to a best-of-three series in FIFA, and the 19-year-old in him appears. Noel, moments after the Feb. 12 ACL tear that crumpled his left knee -- and damaged his draft stock. Gaming over, he flips to the Eastern Conference finals between the Heat and Pacers, watching intently, reflexively skimming his finger over the pink scar on his left knee. And in the middle of what feels like a playdate -- at various points, Noel and his friends swipe each other's iPhones, trying to guess passwords -- it seems incongruous that this bony kid will soon be sharing the court with the men on-screen. To date, in fact, most of his NBA interactions have been recuperation-related. Rajon Rondo and Lou Williams, who both tore ACLs this season, extended Noel encouragement when they saw him in Pensacola. Former Kentucky star Derek Anderson, another ACL victim, visited him in Lexington to offer counsel. Roy Hibbert, who once recruited Noel on behalf of his alma mater, Georgetown, texted words of support. And yet watching Hibbert on TV now bang against LeBron? "Roy Hibbert," Noel marvels to nobody in particular, "is big as s--." The Pacers center, whom he would be tasked with battling, is four inches taller than he and, at 280 pounds, 50 pounds heavier than Noel's dream weight for his rookie season. "Noel is an incredible thinker on the defensive end," one Eastern Conference scout will say. "He can average 10 rebounds a game, three blocks and be all-defense. But I'd be surprised if he's more than a 14-point scorer in the NBA. He's never going to have a post game; he'll always struggle to hold position against big guys." It's the very doubt that will leave Noel clenching his jaw in the greenroom on draft day, promising vengeance to USA Today on the five teams that passed on him: "Oh yeah, I'm going to make them pay." AT 11:30 P.M., when Dorcina would return home after the night shift, her two oldest sons, Jim and Rodman, would routinely greet her before falling asleep. But only little Nerlens would bring a gift: a drawing of flowers sometimes, or a colorful construction-paper card that he'd made at school. "Jim and Rodman would say they forgot theirs," Dorcina says, laughing. "And I'd ask, 'But how come Nerlens didn't forget?'" Which is by way of saying that mother and son have always shared a certain bond. On the day of her son's surgery, Dorcina was so nervous she couldn't eat until he woke up from anesthesia. To this day, whenever she happens to see the clip of his injury, she closes her eyes and turns away. Nerlens was able to get his first tattoo at 15 because he passed for 18 on account of being 6'8". There was no debate about what to get. He had dorcina inked on the inner part of his left forearm and dedication on the outer. And now, in between all the hours spent trying to demystify his professional future -- no shortage of which are devoted to developing a reliable 15-foot jumper -- Noel still thinks about how best to repay the woman who lifted patient after patient at three nursing homes, until the day last year that her back finally gave out. So with his expected roughly $3 million inaugural NBA deal, will he buy his mom an all-expenses-paid vacation or two? A car? A house? He'll offer only this: "It's going to be over the top and really special." Noel laughs, then declines to divulge any further details, lest he spoil the surprise. But one thing is already obvious: He cannot wait to tell her.